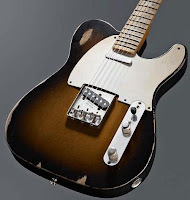 Fender has unveiled its new Roadworn series, which brings Custom Shop-style relic finishing to players who can’t afford to spend thousands on a carefully bashed-up axe, but still want the look, feel and vibe. I guess cynics might say “Just buy a Mexican Strat and drag it behind the car” but I think these are kinda cool. I think they’ll be even more cool after a few years when they’ve been knocked around for real and the edges of the factory-worn paintless spots start to get all funked up and more authentic-lookin’. Maybe in 20 years they’ll release a new series of Roadworn Relics, which simulate two decades of wear on a 2009 Roadworn model. 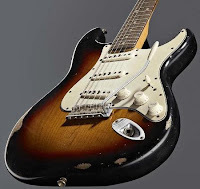 The Roadworn series is based on Fender’s 1950s and 1960s designs but with modern features including taller frets and hotter pickups. The line will be officially launched at NAMM.